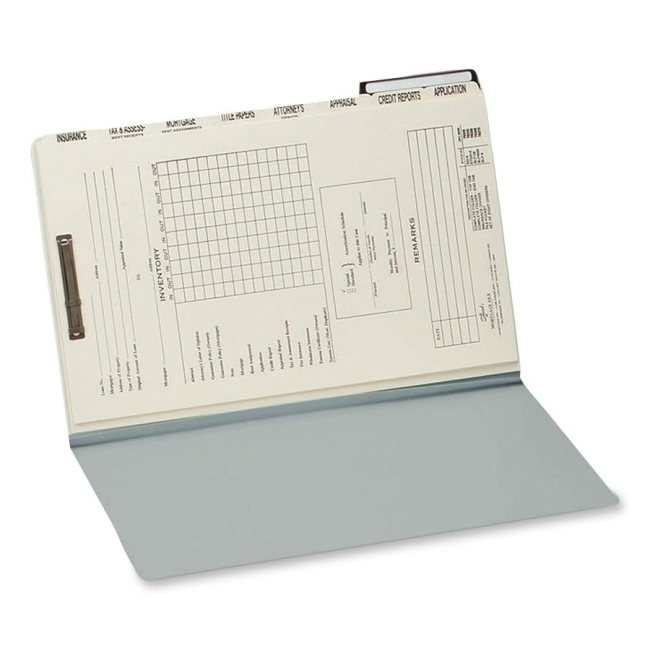 Smead Mortgage Folder - 8.50" x 14"
Pressboard folders with 1/2" high metal tabs and preprinted dividers simplify mortgage paperwork. Organize paperwork using eight manila dividers with preprinted tabs. Tab headings include Insurance, Tax and Assessment Receipts, Mortgage, Title Papers, Attorneys Opinion, Appraisal, Credit Reports and Application. Front divider has a preprinted form for mortgage applicants basic information and an inventory checklist to keep track of documents added to the folder. Each folder includes a manila jacket for smaller papers, certificates or photos that cannot be hole-punched and a fastener compressor for tightly binding contents. Flat metal tab in top tab position has a replaceable insert. Printed tab dividers and jackets are sold separately so you can reuse the folder. Each folder is made of 25 point Pressboard stock. Offers 1" expansion, matching-color Tyvek tape and 2" prong K-style fastener. Contains 60 percent recycled material with 30 percent post-consumer material. SFI Certified.